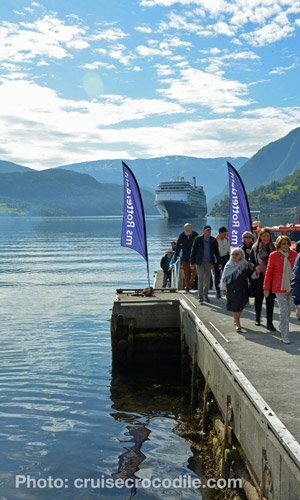 Our Ulvik cruise port guide gives you information about the docking location, cruise dock, transportation options and much more! 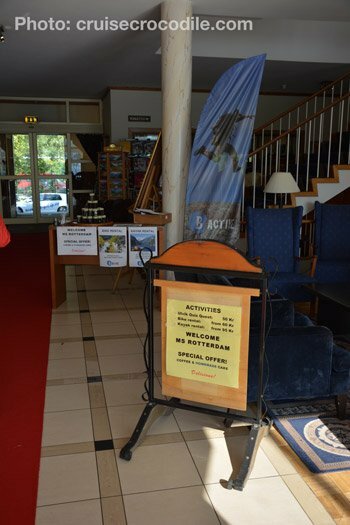 Welcome to the Ulvik cruise port guide. Ulvik is a small village with just over one thousand inhabitants. It lies hidden at the end of the Hardangerfjord, also known as the Queen of the fjords. The cruise ship leave open sea and will sail land inwards for about 6 hours before they reach this port. Along the way you will be stunned by the beautiful landscapes that will come by the ship. The town of Ulvik is small. Most of its income is based on tourism, fishing and fruit. Especially this last one is what makes Ulvik a unique destination. It is nicknamed the orchard of Norway because of its cherry, pears, plum and apple production. In May the fruit blossoms start, which will make it a spectacular scenic spot. June to until October is when the locals harvest the sweet fruit and produce their famous local specialities of which the most well known is the cider. There are lots of things you can do around Ulvik. Find your options below. The cruise ship will drop anchor in the fjord and the small tender boats will tender you ashore. The tender pier is in the middle of town. You will find the tender pier is front of the Brakanes hotel. In the hotel you will find facilities like maps, area information and local products. In Ulvik there is no pier large enough to facilitate cruise ships. Therefore ships drop anchor in the fjord and tender you to shore. The tender pier is right in the middle of town in front of the Brakanes hotel. 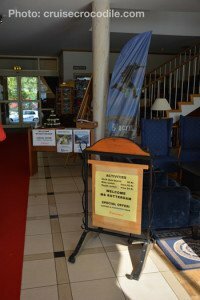 At the Brakanes hotel you will find a terrace, small bar, free wi-fi, maps, area information and also local products made in the area. When you walk through or around the hotel you will face the small city center of Ulvik. The city center of Ulvik is extremely small and we would like to recommend you to not stay in town all day. You can either book an excursion through the ship which would be nice and easy. You can also choose to arrange things independently and go hiking, biking, kayaking or join one of the small tours from the tourist information center. A few hundred yard to the right of the tender pier (see map above) you will find a tourist information center. This is where you can pick up your local maps, hiking maps and see what local tours are offered that day. They usually offer local tours like a Glassblowing workshop, guided tours to the Syse fruit- and ciderfarm and a historical townwalk. Close to the tourist information (see map above for exact location) you will find an activity center. This is where you can rent bicycles (price starting at 60 Norwegian krone) and kayaks (price starting at 95 Norwegian krone). Both are a fun and active way to get around. Please note that the bicycles tracks go up and down, so be prepared for a workout. There are only a handful of taxis available in Ulvik that are usually not available. If you would like to get around by taxi it is wise to prearrange it at home. There is public transportation in Ulvik, but it does not go frequent enough to get back to the port in time. This hotel is the first thing you will see when you walk onto the pier. 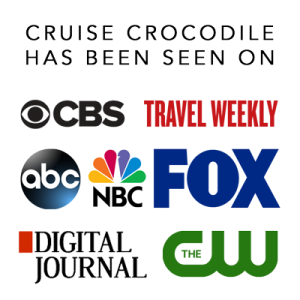 This large hotel also offers facilities for cruise guests. Either get a cup of coffee, free w-ifi, taste local products or get a map here at this beautiful hotel. This is the tourist information in Ulvik. It is close to the pier. Get any kind of information on transportation, tours and hiking here. Or perhaps just pick up one of the locally produced souvenirs they offer here. The tourist information centre is about 300 yards to the right hand side of the tender pier. See its exact location in the map above. Why not do something adventurous and go kayaking in the Ulvik fjord. For 95 Norwegian krone you can rent a kayak at the adventure centre and enjoy the fjord from a whole different perspective. Not to worry about the water, it is extremely calm in the fjord. Just make sure to dress in layers so you are prepared for all types of weather. The area of Ulvik is called the orchard of Norway. It’s fruit has a good reputation all around the world for being so sweet. A lot of the income in Ulvik depend on the fruit production. 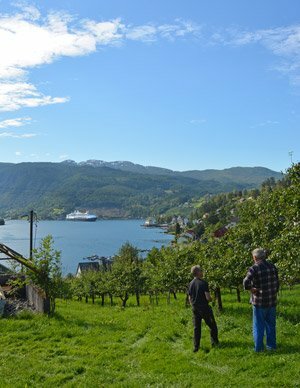 Therefore you will see fields and fields of plums, pears, apples and cherries when you arrive in Ulvik. There are lots of vikings paths in the area of Ulvik. The most popular is the 2 mile trek going by the cider factory. It is an easy and fun walk. Pick up the map at the tourist information. They provide regular and expert maps. Close to the dock you will find this centre where you can learn about Olav H. Hauge. He was a famous Norwegian poet. At the centre you will find exhibitions, a library of poetry, poetry workshop, museum shop and cafe. 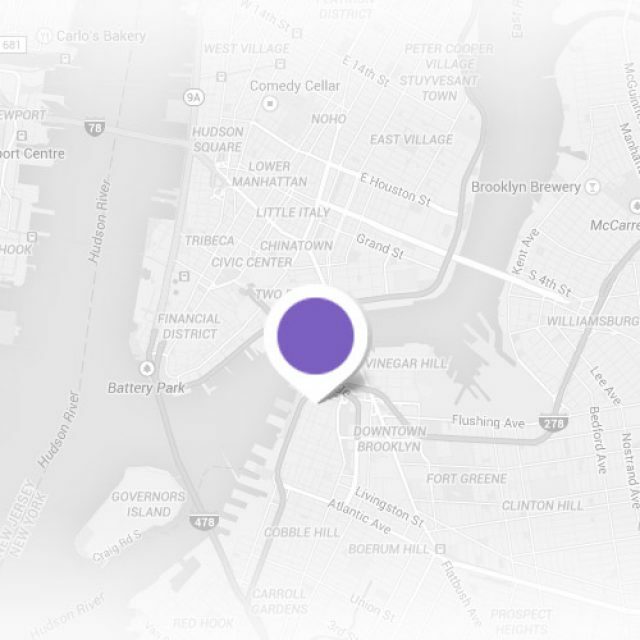 See the exact location on the centre in the map above. Next to the tender pier in Ulvik you will find this small harbour. Especially on a sunny day this is a perfect spot to sit down, enjoy the views and activities around you. When the weather permits this is also where you can catch a floatplane tour to see the Norwegian fjords from above. The Ulvik activity centre is where you can rent bicycles and kayaks or simply get a cup of coffee. See the exact location of the activity centre in the map above. It is possible to go dog sledding in Tromso in winter and summer time. Do book this ahead of time thoug. You can most likely book the standard excursion on board or direct at the Tromso Villmarkssenter. Ulvik does not have a pier available large enough for cruise ships to dock. Therefore your ship will lay at anchor and tender to you to shore. Your cruise pier is located in front of the Brakanes hotel in Ulvik. This is located in the center of the tiny town of Ulvik. Read all about your options on what to see and do in our full Ulvik cruise port guide. Hardanger cider is a famous local product. Within walking distance of the pier (1 mile) you will find the first cider factory. Get acquainted with the way the cider is made and of course have a try while you are there. Pick up the cider map at the tourist information or join the guided walk to the factory. The eye-catcher in Ulvik is the white wooden church. It was build in 1859. The first church to be build on the spot was a stave church. The altar chalice, baptismal font and church bells in the present church are all from the 13th century stave church. The church is open when a ship is in port. This open air museum takes you back in time. It exhibits historical buildings, embroidery, traditional costumes and fiddles of the are. The museum is a 1 hours and 15 minute drive west of Ulvik. If you would like to visit this museum we recommend you to do this by your ships excursion as transportation in the fjords is limited.